There are three types of people in the world. What three? One who is like carving on a rock, one who is like scratching on the ground, and one who is like writing on the water. What sort of person is like carving on a rock? Imagine a certain person who is always getting angry and his anger lasts long, just as carving on a rock is not soon worn off by wind, water or the passing of time. What sort of person is like scratching on the ground? Imagine a certain person who is always getting angry but his anger does not last long, just as scratching on the ground is soon worn off by the wind, water and the passing of time. And what sort of person is like writing on the water? Imagine a certain person who, even though spoken to harshly, sharply and roughly, is easily reconciled and becomes agreeable and friendly, just as writing on the water soon disappears. (A.I.283). Thank you so much for this post. I remember a story in Khmer from when I was younger using these exact terms to discuss anger. I never knew that the story had its roots in Lord Buddha’s own teachings! For about one year I have regularly been reading your musings with interest and appreciation. Thank you! And this is why I have finally decided to write you back: Today's posting has greatly helped me in an ongoing conflict. It has reminded me that "my" viewpoint is not "I", not "Mine", not "My Self". In the heat of the argument sati (remembering) had been gone. And when remembering is gone, being reminded is just as good! When I read your posting this morning I experienced a great relief: I could feel that all those harsh words had been written on the water. After a good metta meditation I picked up the phone and had a very fruitful talk to the other party, who was equally relieved. And so this has helped two people today! Thank you! May you be peaceful and happy! I love this picture. The moment we see it, we know something more than words can tell. And after that moment it takes us to very quiet place.
" 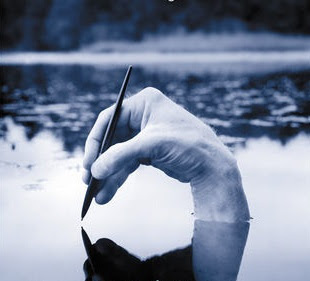 i think im a writer in the water"
I am afraid that may take some time. The way I understand it, those who "write on water" refer to those who have reached the penultimate of attainment, that is, the arahants. They have no more clinging to things of this world, or to this world. They would be happiest if they can shake off this last body and be done with rebirths. Therefore, nothing in this world could possibly disturb them, least of all to rouse them to hate or anger. They leave no trace of any negative kamma, just like writing on water will not leave any trace at all. I suppose most of us are not arahants :) So we are the ones, ordinary mortals, who will etch on stone or write on the sand, mostly the former rather than the latter I would think. Interestingly, I remember a story about Jesus actually writing on sand.